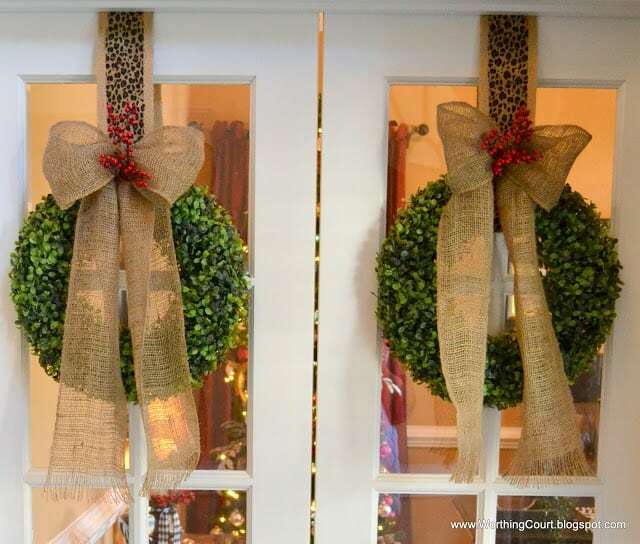 Nancy’s office is located just off of the foyer, behind french doors adorned with one of my fav’s – boxwood wreaths. The leopard print accent is just a hint of things to come! Although I’m not showing your her entire office, I decided to give you more than just a peek. The tree is just stunning! 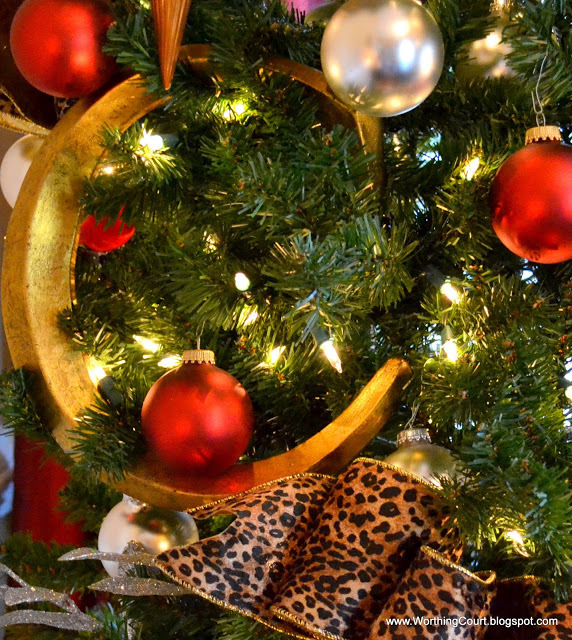 It is a wonderful mix of reds, golds, browns, animal print and sparkle. 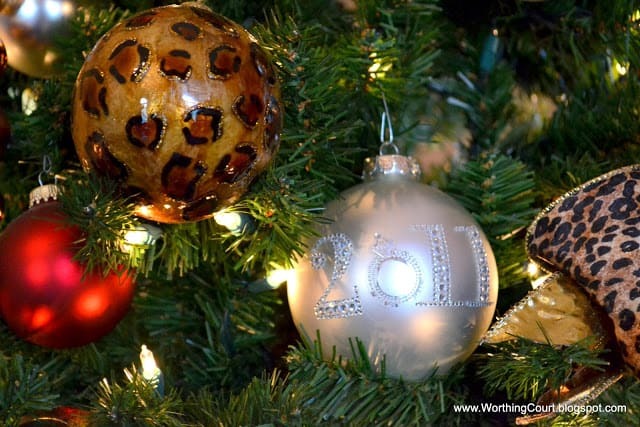 Nancy used blingy thingys from HobLob to turn simple ornaments into a work of art. She even created an ornament to celebrate her marriage this year. Notice that the zero in 2011 is a ring! 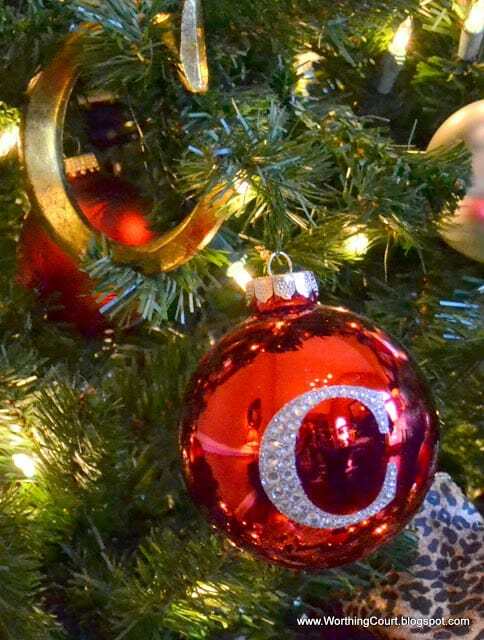 Large and small wooden “C” letters (her last name starts with the letter C) look just great on this tree. Even the presents are decked out in all of their finery. You may have noticed in the first picture that there is a fireplace to right as you enter the office. Leopard print ribbon is generously interwoven among the lush greenery of the garland. A trio of candles on one end of the mantle along with pheasants, feathers and stars. One of the candles has a beautiful cross attached to it. And aren’t those faux fur stockings wonderful??? 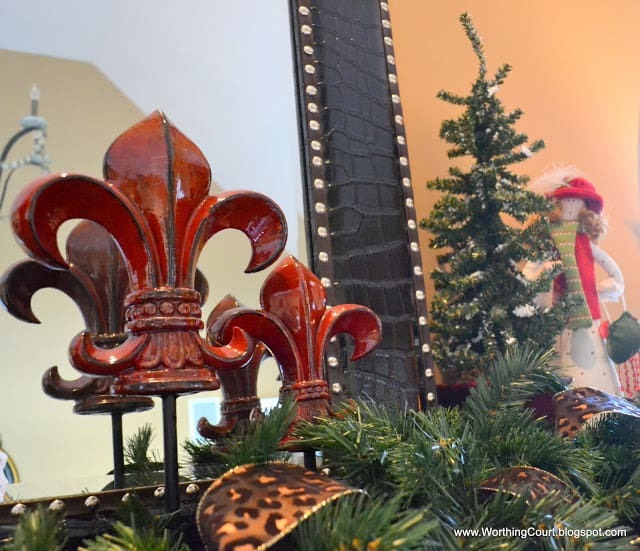 Oversized fleur de lis along with a whimsical shopping woman is on the opposite side. More faux fur stockings on this end too! This wraps up the room by room tour of Nancy’s Christmas house. 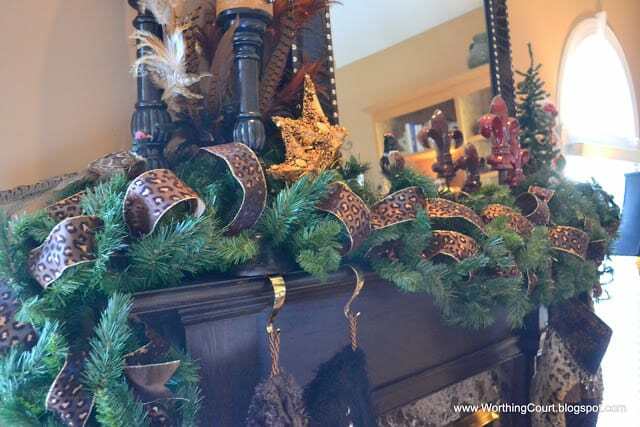 But come back on Friday when I’ll show you more Christmas vignettes that are scattered throughout her home. You can see Nancy’s outdoor decor here, the living room and dining room here and the kitchen here. Suzy, this office is absolutely GORGEOUS!! I love everything about it!! Just stunning! Now that is a “wild” office. 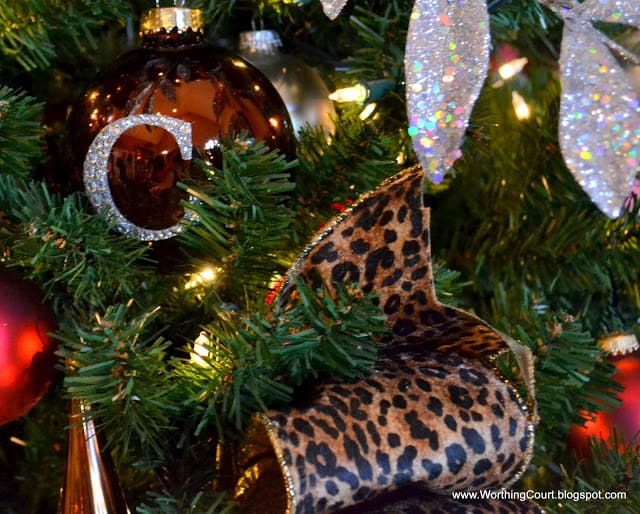 Great animal prints and love the bling monograms on the ornaments. Merry Christmas! Gorgeous! 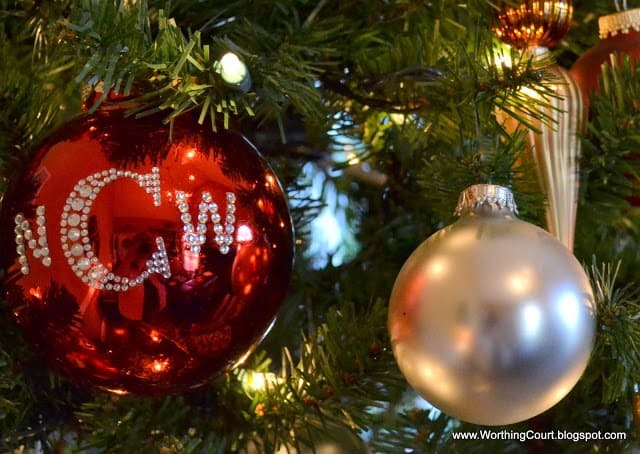 Love the Monograms on the ornaments! Great idea! Beautiful! 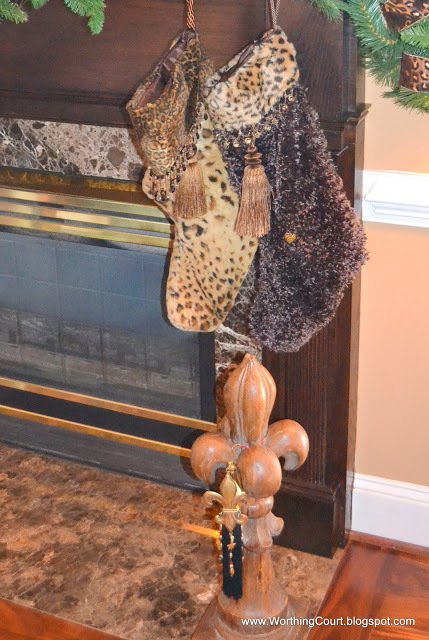 Love the leopard print mixed with the burlap! Wow, what an office. So pretty. I am LOVING these tours!! Please thank her for allowing you to share her beautiful home with us! WHAT an office! You should see mine….HAHAHA!!!!!!!!!!!!!!!!!! XO, Pinky PS, I LOVE animal print so this office is really speaking to me! I think I need to meet this Nancy. :0 Thanks for sharing at BeColorful. Nancy’s office is beautiful! 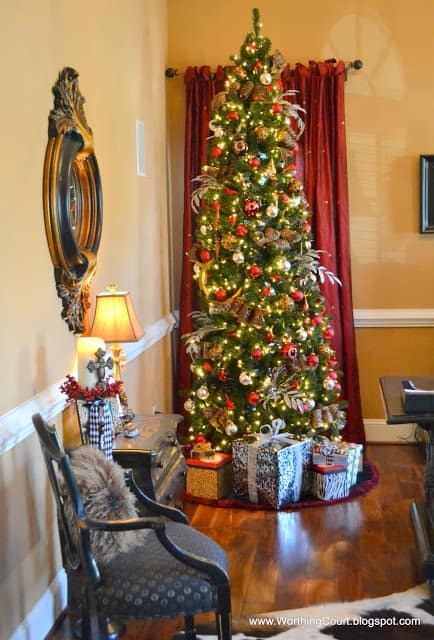 Love the mantel and tree. What a fabulous office! 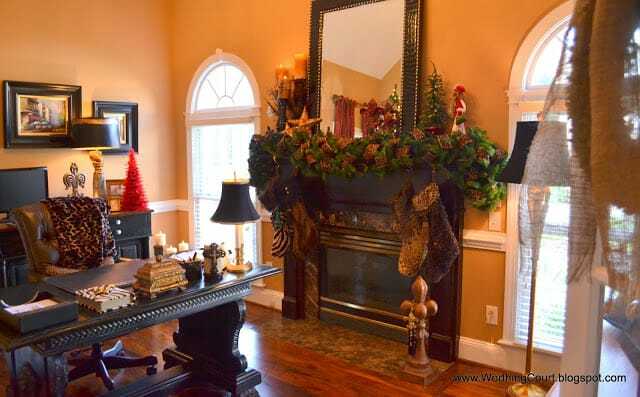 Great mantel, tree and wreath! Hi! 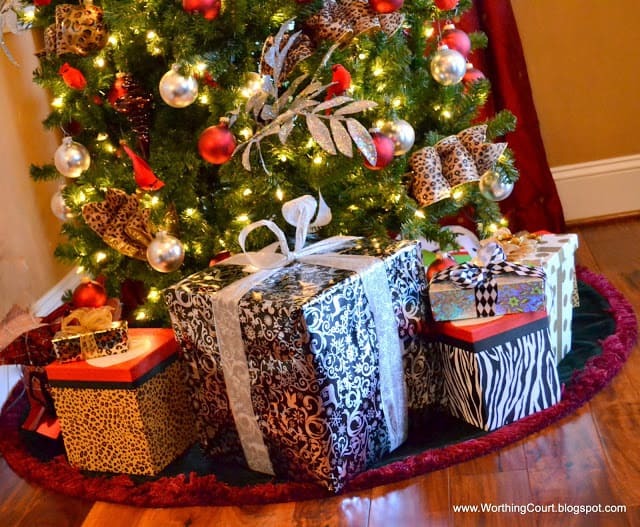 Where is that Leopard and burlap ribbon from? Looks AMAZING!! Hi Megan. It is two different ribbons that are layered together and I believe they came from either Michaels or Hobby Lobby.